Twenty-five year-old San Francisco resident and aspiring architect Suzanne Monaco was killed by the driver of a pickup truck yesterday while crossing Masonic Avenue near Euclid Avenue. She is the sixth pedestrian killed in the city this year. The four to five-lane section of notoriously dangerous Masonic Avenue is known for speeding car traffic and poor visibility between street users, hindered by a steep rise over a hill. The Euclid intersection also has several speed-inducing “slip-turn” lanes, which pedestrians must often cross in several phases from island to island. Monaco was outside of a crosswalk, according to reports, and though it isn’t clear how close she was to the intersection, a rough look using Google Maps indicates that the nearest crossings (at Euclid and Geary Boulevard) are about 1,050 feet apart, or the length of three blocks in that area. Although the SFMTA is working on a plan to improve pedestrian and cyclist safety on Masonic between Geary and Fell Street, the hostile conditions on the stretch where Monaco was killed would remain, despite the retail businesses that attract foot traffic, including the popular Trader Joe’s grocery store that Monaco may have been visiting. Aerial photos from the David Rumsey Map Collection taken in 1938 indicate that this stretch of Masonic was an extension built around 1940 to connect the street’s former terminus at Geary to the end of westbound Pine Street after the Laurel Hill Cemetery was removed. It has become one of the city’s most dangerous corridors since, but a push for safety improvements has gained momentum in recent years. In August 2010, calls for safety fixes on Masonic ramped up after 22-year-old German Nils Linke was killed while biking on Masonic at Turk Street by driver Josh Calder, who had been drinking. Calder is scheduled to face manslaughter and DUI charges at a trial beginning on July 13. 61-year-old James Hudson was also killed by a drunk driver traveling nearly twice the speed limit at the same intersection one year ago. Monaco, described as “an impassioned, conscious and at times whimsical designer,” worked at local design firm 450 Architects and was on her way toward certification as an architect, according to the Chronicle. Originally from Chico, she held a Master of Architecture degree from Tulane University in New Orleans, where “she fostered a passion for socially, culturally, and environmentally sustainable design,” according to her biography on the 450 Architects website. 450 Architects principal Richard Parker told the Chronicle that were it not for her tragic death, Monaco would have lived to see her plans for new SFUSD playgrounds brought to life, which she had just completed on Friday. “She was looking forward to it,” Parker said. Those generously-curved turn lanes encourage maintaining a high speed through those turns, even when it’s impossible to see the road ahead. They should be eliminated. 1050 feet without a crosswalk is a crime against humanity. Doesn’t the city have some kind of maximum length for road segments without a crossing? Van Ness does this too. I saw someone do this just two hours ago–cross in the middle of the block, grocery bags in hand, from Trader Joe’s to a parked car immediately opposite on the east side of the street. People do this *all the time*. So very dangerous because there’s a slight rise for southbound cars preventing a sight line of the likely crossing point until far too late (and yes cars are usually going fast to make the light at Geary unless traffic is backed up.) The traffic going north is coming around a slight curve so they also don’t have a great sight line much in advance of the likely jaywalking/crossing point. Even if cars routinely never went over 25mph, it would still be extremely dangerous to cross mid block here due to impaired sight lines, (although at 25mph, a car is far less likely to kill than at 35mph.) But since the parking queue for Trader Joe’s is always at least five minutes (often ten or fifteen), if there is spot open on the east side of the street, people will grab it and then be tempted to dart across four lanes of fast moving traffic because the crosswalk is a long ways away. Solutions? Possibility 1) Eliminate temptation by getting rid of parking on the east side of Masonic between Geary and Euclid altogether. Possibility 2) put in a mid-block crosswalk with a pedestrian activated signal that would stop traffic when someone needed to cross. Possibility 3) Get rid of parking on the east side of Masonic *and* insist Trader Joe’s charge customers $2 to park in their lot. (Trader Joe’s should also reconfigure their entrance from the street to be far more pedestrian and bike friendly.) Then the lot would always have space available (and not so much San Francisco public street space would be devoted to being a de facto parking lot.) Possibility 4) Slow traffic way down (under 20 mph) and install a crosswalk midblock without any signal protection. Would probably have to add speed bumps for a least a year to get cars to slow down enough after so many years of flying through here. What is likely to happen? Nothing at all. Cars will continue to go 30 – 35 mph; Trader Joe’s queue will continue to be long; people will continue to risk their lives darting across Masonic. My sincere condolences to Suzanne Monaco’s family. With better street design that took into account human behavior (travel lines of desire, cars propensity to speed with certain types of street design) this death could have been avoided. RIP suzanne, a beautiful young life cut short. A truly tragic incident – may the street finally be redesigned in Suzanne and the other victims’ honor. Have TJ’s get an Android with farebot and reimburse customers who rode MUNI within the last 30 minutes their $2 MUNI fare with a purchase over X dollars. Why do we validate parking and not MUNI? One possible difficulty of having a pedestrian crosswalk to TJ’s is that n. bound traffic might end up by blocking the intersection at Geary but it’s such a good idea to have a crosswalk it’s probably worth a try. That, and a speed limit of 25mph, strictly enforced might help. I witnessed a driver tonight make an illegal u-turn and drive up onto the sidewalk in order to then get in line to the parking lot for Trader Joes. What’s more, a pedestrian was maybe 30 feet from where the car landed on the sidewalk. It took al I had not to confront this driver. Another article short on facts, long on opinion and misinformation. Possibly even intentionallly misleading information. Was she walking westbound as reported? I doubt it, if she was leaving the store as reported most likely she would have been eastbound. Does the photo best represent the location where she was hit? I also doubt that. There are four lanes not five where she was most likely hit, but that does not fit the narrative the author would like to present. Was this incidient similar to the other pedestrian fatalities? I also don’t think so, because it seems pretty clear that this woman was in the wrong. She was jaywalking in the middle of an extremely busy thouroughfare, hundreds of feet from a crosswalk, taking a foolish risk to save some time crossing the street after leaving Trader Joe’s. Probably everyone who regularly drives that stretch of road has had a close call with pedestrians who take the same foolish risk. Is Masonic dangerous? Absolutely. Should it be redesigned? Yes. This is a terribly tragic incident and I feel terrible for her friends and family. But to slander the general public for taking this “too lightly” is highly condescending nonsense. I used to ride my bike along this very stretch three times a week, so I know from personal experience how dangerous it is. I also have also seen the SFPD run pedestrian “stings” a few blocks around the corner on Geary only to have the very same SFPD ignore blatant violations of pedestrian safety the next day in almost the same location. Maybe Mr. Helquist and Mr. Bialick should address those issues and climb down from their high horse instead of lecturing us, the unwashed masses for our insensitivity and “numbness”. Maybe we don’t trust our public officials and cycling and pedestrian advocates who come up with questionable ideas like the one pictured right next to this story, which waste public money while putting pedestrians and cyclists on a literal collision course on JFK in Golden Gate Park. Yeah, SFGate did a bang up job. It was reported she was returning a shopping cart – e.g. Westbound. This incident was similart to the other fatalities in that it was preventable. It might take some heavy lifting to prevent it, and yes, the general public doesn’t necessarily want to do that lifting. Starting apparently with you. Once again streetsblog shows it’s double standard. No article about Dionette Cerney who crossed within a crosswalk and was killed by a bicycle running a red light. No article about Sutchi Hui killed crossing within a crosswalk at Castro and Market. But if a Pedestrian (returning to her car) jaywalks across 4 (or 5) lanes of traffic, it gets top billing. What media has the double standard? Matt, all you need to do is read the comments section in SF Gate to get a sense of what the public thinks about this incident. Many believe it was the young woman’s fault (they get thumbs up). Others (who are being given thumbs down) think the motorist is to blame. Only a very few think maybe the built environment is the problem. We engineer what we reap. Build wide multi-lane streets that drivers view as speedways and they will speed as they do on Masonic. Build narrow, short block streets with stop signs like on Sacremento and people will pay more attention and go slower. To suggest that this is simply a matter of enforcement is forgetting the visual cues that motorists look for. Ask yourself this – why was she crossing the street in the first place? Shouldn’t we make streets where people feel the need to cross look that way so motorists will be more intune with their environment? Oh – and nice one to try and incite people with the off-hand GGP cyclist comment. The idea that a 3 foot wide cyclist traveling at 15 mph is in any way equivalent in danger to pedestrian as a 5 foot wide car going 35 mph is laughable. 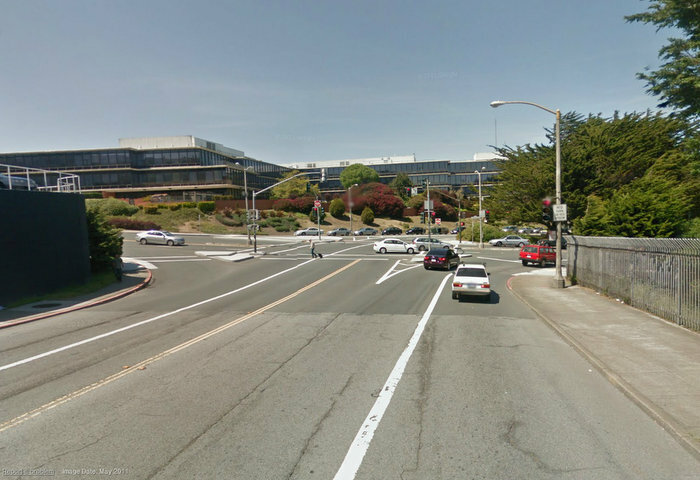 Another option would be a center median that isn’t possible to cross, like they have on Geary by the Kaiser Clinic. Remove the possibility of temptation. Logan, if you want to read about those tragedies, feel free to wander on over to SF Gate. I think there’s quite a articles about them over there. By the way, there were 28 pedestrian deaths in the city last year (2011). Can you name all the victims besides the one caused by a cyclist? Unfortunately we don’t always have the resources to give as much attention to every fatality as we’d like. But we do what we can do have the most impact and provide perspective. @c585327298003cd70c076cf17c8556e2:disqus Center medians serve to increase driver speeds. Logan, you should really check the archives first. That way you could prevent yourself from saying something that makes you look like a reactionary. The speed limit appears to be 25mph. The woman crossed a couple of lanes before entering the south bound lanes. Broad daylight. Straight road. Yet still the driver didn’t have time to avoid her? Why aren’t the police even talking about investigating the case to see if the driver was speeding? And why do we still have roads that are purely designed to induce speeding? I’ll leave the ridiculous accusations aside and just point out some things regarding the information I provided. – Westbound crossing direction was reported by the Chronicle, as indicated. Take it up with them if you don’t believe it. – Location of where she was hit: The Chronicle and Bay City News reports indicate only that she was hit “near Euclid” and that she had groceries. The photo location was the best spot I could find, using that information, to display the street and the Euclid intersection. If you somehow know any more specifics on where she was hit, please divulge. – Masonic is five lanes on the approaches to Geary and Euclid. The five lanes at Euclid are in the photo. I made this a bit more specific in the article to address your concern. – As for comparisons to other pedestrian crashes, the main point is not about who was “in the wrong”, but that Masonic is designed to induce speed and carries a heavily disproportionate number of crashes and deaths, and that the likelihood of those can be significantly reduced with changes to the street. Dionette Cherney did not get her own article with a photo of her 24 hours after her death. Sutchi Hui’s article was about media double standard, I didn’t see a photo of him or discussion about the intersection. Sorry the tone of those articles as always were very different than this one. @c585327298003cd70c076cf17c8556e2:disqus On Geary there’s a generous median to put a barrier in. On Masonic, there’s a stripe of yellow paint. The two center-most lanes are already pretty tight (which you would think would slow down traffic, but not really) as are the two western-most lanes. The easternmost lane has some extra room to buffer people getting out of parked cars. The city could take 18 inches of that and allocate it to a center median, but then it would be quite dangerous to get out of parked cars unless car speeds *really* dropped, say under 20 mph. People take Masonic to get to Bush which is a fast shot downtown and to get to the Presidio (or to cut through the Presidio to get to the Marina and Lombard.) This particular block in question carries an absolutely stupendous amount of traffic during morning and evening commutes. Once the new Target goes in at Geary and Masonic this area is going to get even more congested. 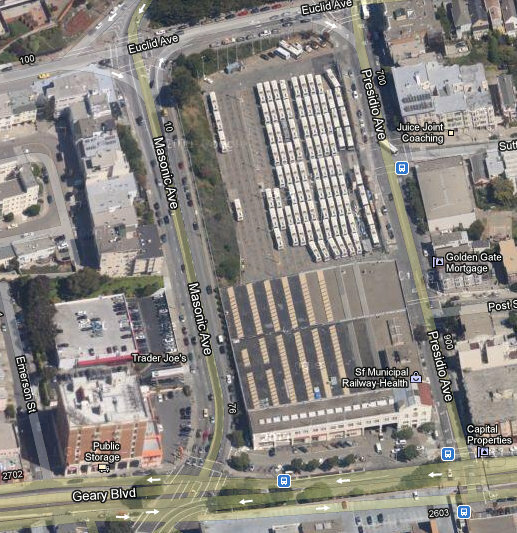 Just how many cars should Masonic/Geary be expected to handle? People generally drive because it is more convenient than other options (cheaper//faster/more pleasant.) As San Francisco’s density increases the city is going to have to wrestle with whether to continue to optimize car traffic flow (which encourages additional car use) or discourage car use and optimize almost everything else (pedestrians, bikes, transit, neighborhood liveabilty.) As long as this block connects the mini-freeways of Pine and Bush to Masonic, this block will remain an ugly mess, Trader Joe’s or no Trader Joe’s (though Trader Joe’s popularity does make it a little worse.) As a driver, I love Pine and Bush! As a driver, I take Masonic because it’s the only decent north-south street for miles in either direction. There are a number of heavy-duty, intentional reasons why this block is a traffic sewer. @facebook-100001895311343:disqus will continue to move the goal line. He’s not arguing to be right but for Streetsblog to be wrong. This about moving the discussion towards semantics and away from substance (e.g. current design of streets for high speed traffic). Maybe I missed it, but I see no mention of the fact that she was not in or even near a crosswalk. Monaco, who had just left a grocery store, was not in the crosswalk when she was hit, police said. It’s tragic to learn of yet another preventable death on the streets of SF. The proposed Masonic redesign ought to have indirect benefits for the stretch of Masonic north of Geary. With bus bulb-outs, Muni line 43 will become a faster travel option and cycling, of course, will be a safer option, too. Travelling to the Masonic Trader Joe’s from the south by bus or bike will be a more attractive mode if Masonic is redesigned as proposed. I wholeheartedly agree. It seems so incongruent for alledgedly pro-environment stores like Whole Foods or REI to make it easy to drive to with ample free or validated parking while environmentally more benign options are afforded little cost or consideration. I thought you were done with us, @facebook-100001895311343:disqus ? Why keep coming back? Confront them next time, or call and report their behavior to the non-emergency SFPD line. When they do cause an accident with their reckless behavior at least there will be a prior record of it. The most effective way to reduce traffic and increase transit usage is to offer home delivery service. Not a lot of people are interested in walking with bags of groceries for blocks, or go to the store everyday to buy a small amount. I think speed bumps is an easy solution. Install them wherever there’s tons of foot traffic. Ironic that when discussing bus stop consolidation, 1050 feet would be considered somewhat good stop spacing – not too far, not too close. If she had crossed the street properly IN the marked crosswalk, and having the GO walk signal up, she would be alive today. Not necessarily- quite a few pedestrians have been killed while in the crosswalk with the right of way, a crosswalk is only paint. I would like to know if speed or distracted driving were factors. If the sun was in the drivers eyes, they should have slowed down so they could respond in time. It is a drivers responsibility to drive at a speed that is safe under prevailing conditions. I did not know of Suzanne, until i read this story. I too, am from her hometown of Chico. After reading this, I am very saddened by the loss of the young ladies life. She seemed to have wanted to have make a difference in this world. I am sure her family can be proud of her and the advancements not only she made upon her own life at such a young age, but many for others around her as well. I remember either wanting to comment (…or maybe I did? Can’t remember) on the glaring omission of this stretch of Masonic during the big discussion about the SFMTA’s big reveal of ‘intended’ Masonic improvements. So first of all, how about that lack of anything happening whatsoever? Second, can we possibly take advantage of the lack of action on the plan and get them to revisit the Geary-to-Presidio section? It seems vaguely idiotic to me that we’re talking about a major redesign of an urban corridor and it truncates at a point where–albeit it being at a major cross-corridor–the street becomes truly dangerous. Ugly, too–just a broad swath of asphalt in that inimitable style of 1950’s proto-freeways. And smack in the middle of that mini-freeway is a popular grocery store, which of course will attract pedestrian traffic in the middle of a large, congested city. The lack of attention to details like this makes me wonder if our city should be held criminally responsible for pedestrian deaths. I know Suzanne Monaco and she wasn’t crossing the street, the facts given in this article are not accurate. Ans it is not always the writers fault either in situations like this, police do not always tell the truth about accidents when talking with journalists. She was just putting groceries in her vechile and BOOM. Rest in Peace lady! I work as a fulltime tourbus driver/guide in San Francisco since 1996. The number of pedestrians disregarding the law is increasing constantly, especially in the downtown areas. My tourists from around the world are astounded at the lack of law enforcement against pedestrians. IN many countries, the fear of getting ticketed keeps a person waiting until the light turns red, and he looks furtively about if he’s going to cross in the middle of the road as this poor but hapless victim chose to do. If our papers and media had sense, they could use these dead pedestrians as lessons for everyone. Make everyone AFRAID to cross the street incorrectly: show on the news the really gruesome data, including photographs, teach children, adults and elderly to FEAR the cars. A cardriver normally is not intending to kill anyone, at any speed. He is obeying the law, driving properly, and suddenly, an unwitting, unfraid person (when not a drunk or druggie) steps in front of him! The police put the onus on the driver, of course, and everyone condemns him. But is the pedestrian at fault? Yes. To deserve death, no, but certainly involved in his/her own tragic fatal mistake. In some countries, if a pedestrian does run into the street improperly, to be killed – or in this case, injured so that death followed later – the first suspicion is suicide. I seriously doubt that was young MOnaco’s intention, but can it be ruled out? 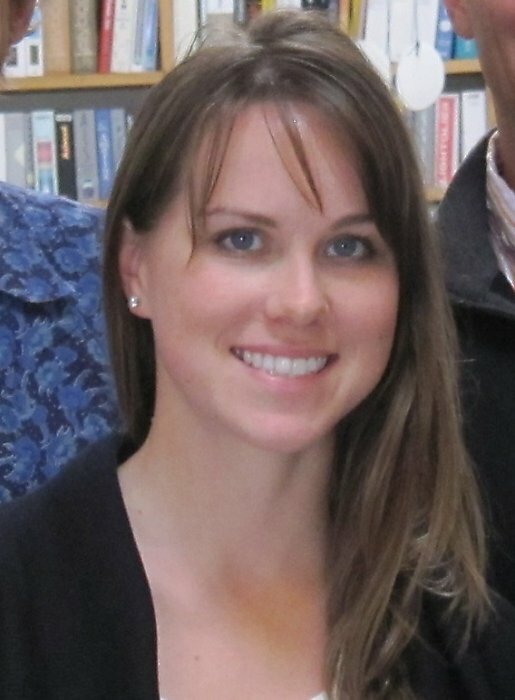 Was a “spatially gifted” person like her, with everything to live for (presumably..no one knows another’s mind…), just beginning a career in architecture, a woman who saw everything in 3D (as per her father on the sfgate article), was she really unable to understand the risk she was taking? Was she perhaps depressed, reckless from a broken relationship, flunking parts of her certification exam? She passed only 2 out of the seven… Was she tired of living on a low salary with roommates, cooking at home, pressed for time all the time?We’ll never know. But I do know that in countries, mostly Europe, where suicide is considered abhorent, one doesn’t even bring it up. This may NOT be a tragic accident, but deliberate, endangering the lives of the car drivers who couldn’t see her in time. I say this both as a pedestrian and a driver, and a native of San Francisco, who rode bicycles for years to get to school. Extreme caution is EVERYONE’s RESPONSIBILITY – but only cardrivers get the kick, not the violators on feet and bikes. mikesonn, medians do not encourage drivers to speed – they increase safety. It would have been helpful here since she could have crossed half of the street at a time. Sure, let’s reserve 99% of the road for cars and only cross at those designated crossings (*only with a lit signal*) that we’ve been so privileged to be given. The road should be included in the Masonic redesign and a better crossing in front of Trader Joe’s added. There are many different design solutions to improve this stretch. Filamino, I disagree. We’ve had many debates here about medians, but my opinion is that they increase speed by lulling the driver into a false sense of security from an opposing head on collision. And forcing pedestrians to cross the street 1/2 at a time is not a win, it is a failure to create streets suitable for pedestrians. This really pisses me off. I wrote to the MTA months ago about this issue and they dismissed it. I’m going to go home, find the letter and post it. I’ve almost hit so many people here and then the fools who drive north bound on Masonic that do U-turns in the middle of the block or at Euclid are so clueless. It is in there. Unfortunately, I saw it yesterday..people still crossing in traffic at dusk while the flower tribute to Monaco is still there. I don’t blame the driver. I blame pedestrians who should not be doing this, the SFMTA who should be posting do not cross signs, and trader joes who closed their upper parking lot forcing people to park in locations where they are too lazy to find good parking. Maybe they should move trader joes across the street to where Mervyn’s used to be. She was putting groceries in her car. Not Walking across the street. @531902c11024456f03060b5c55d3c215:disqus Where is your source for this information?